Today is our first reveal day for our October Release! This month we are releasing awesome new Holiday designs, starting out today with the reveal of our new Sun Soaked Christmas stamp set. We are giving this stamp set away one lucky winner so make sure you read all the way to the bottom of this post to see how to win! Get inspired with Tropical Christmas Cards by our Design Team! Kimberly created a fun soft sunset for her holiday card! Don't those gifts on the beach look so pretty under the palm trees? 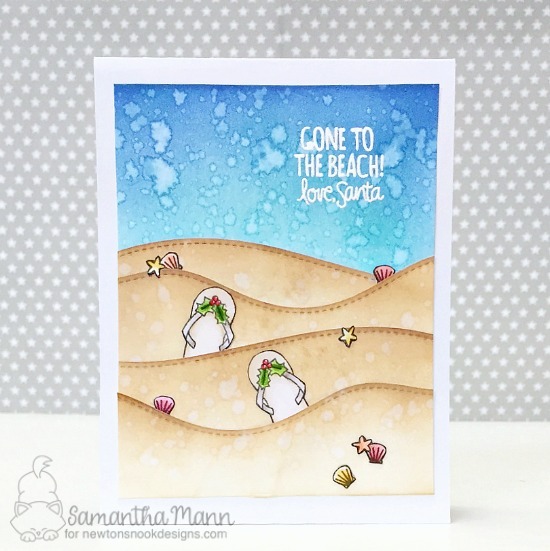 I love the layers of sand on this card by Samantha! So perfect to add in the flip flops! What a fun and unique Christmas Card! Naki created this adorable clean and simple card! The way she used no-line coloring on that snowman and colored him to be made of sand is so fun! What a great tropical themed Holiday card! Deck the Palms! 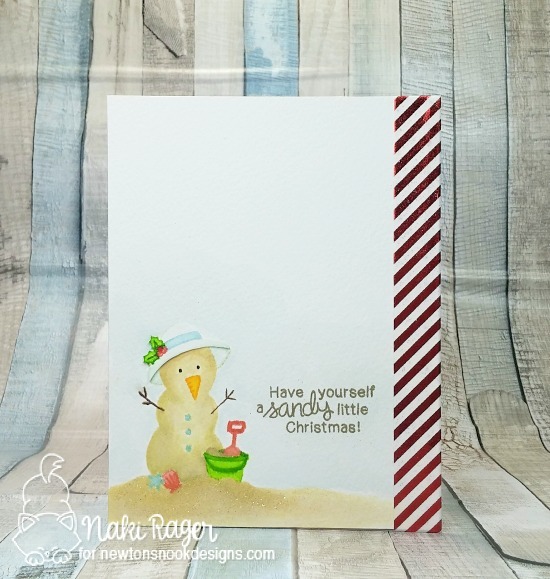 This fun beachy card by Danielle is so perfect for a warm holiday wish! 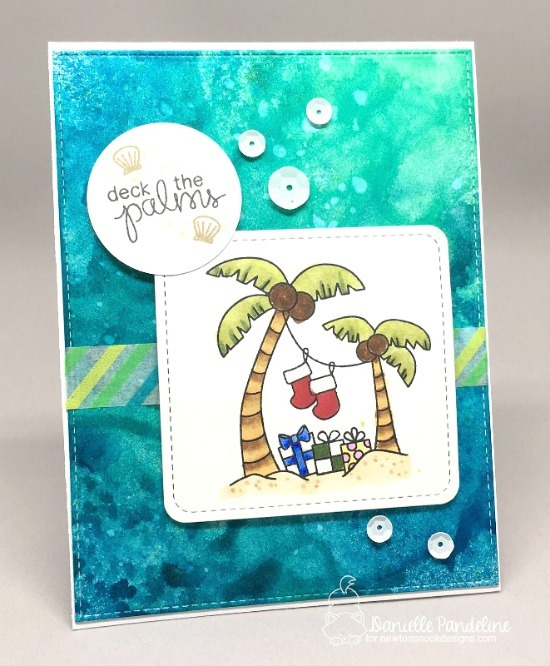 I love the distress inked background she created - looks just like water! 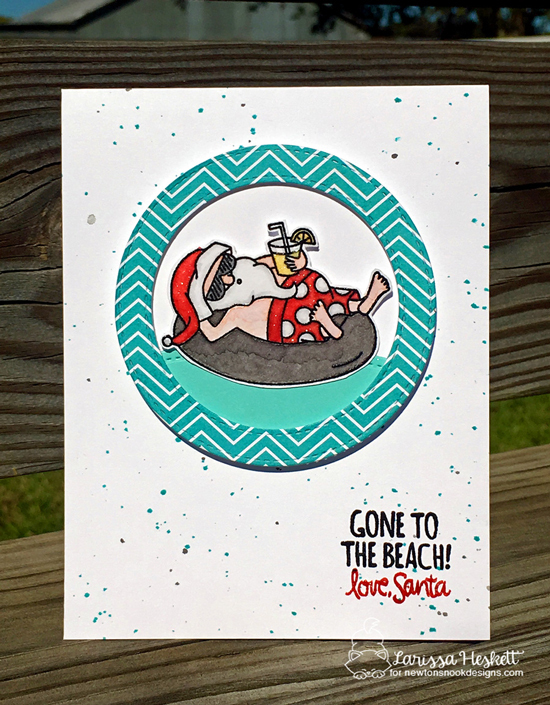 This beachy Christmas card by Stephanie is so cool! 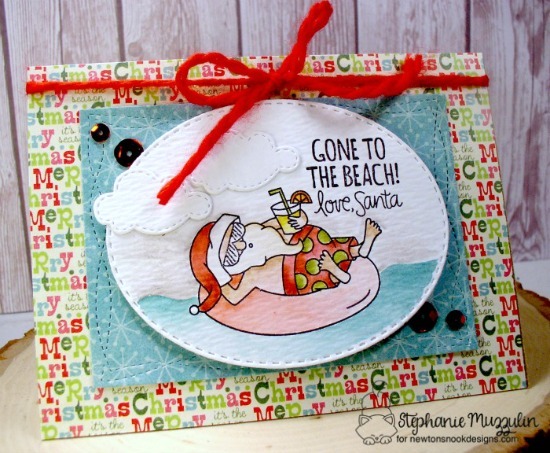 I love the way she watercolroed the santa and used fun pattern papers to accent the christmas theme! The red yarn gives it the perfect finishing touch! Yukari created this fun card using a bunch of the images in this set! I love how the four sections of the card look like little vacation snap shots! 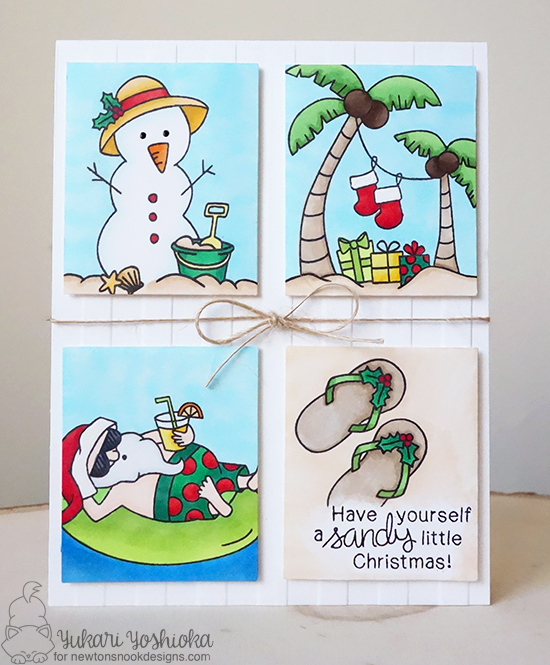 Jess created this sweet holiday card using the flip flops! It's fun how she repeatedly stamped the flip flops but colored in just the one pair in red to pop them out from the others! Here's an adorable Santa card by Larissa! I love the ufn colroing on the santa and the inner tube! What a fun and unique way to share holiday greetings with someone who lives in a warmer climate! Lydia's gorgeous style is just gorgeous to look at! The soft blues on the leaves of the Hibiscus Die is just a perfect combination! And I love that soft, subtle patterned paper, too! 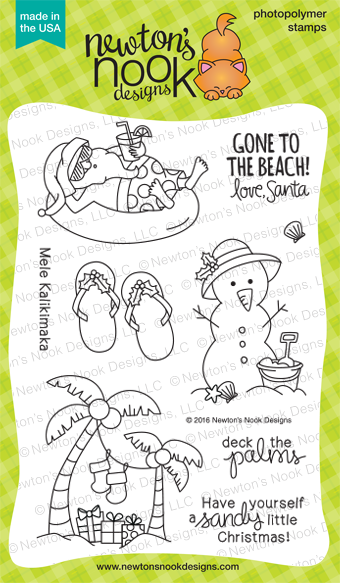 Would you like to win the “Sun Soaked Christmas” Stamp Set? These will be just right for me as my daughter in Perth, Oz will be a lot warmer than the UK. Wonderful to have a stamp set that will be so useful! Great stamp set, especially for us who are in countries with sunny days most of the year! Love it! OK, so I live in sunny So. Florida and this is definitely the type of Christmas we have ... sandy and wearing flip flops. lol LOVE that cute snowman!! stamp set is so great! Thank you for sponsoring cat lovers blog hop over at Her Peaceful Garden! What an awesome stamp set release. Hard for me to imagine Christmas wearing flip-flops, but as the above comment reads, it is a norm for some people. Love the Sandman. Very cute. Very fun release! These cutie make me smile! OMG what a funny set! Too cute! Perfect for cards for my friends that live at the beach! Oh my goodness....this is such an amazing set!!!!!!!! ADORABLE!!! This set would be so great for Christmas cards for my family in Florida! Thanks for the chance to win! Jennifer this is a seriously adorable set and your cards are as awesome as everyone else's. Just sweet! This set reminds me of Jimmy Buffet's Christmas in the Caribbean song! Oh what a fun set! All the cards are fabulously done!! How fun. This is such a cute stamp set. This is the best Christmas set for all of us beach goers!! Awesome stamp set!!! All the designs are so cute !! I LOVE this stamp set. My sister loves the beach and posts something about the beach almost daily. This is one stamp set that I truly LOVE. So many cute ideas and the coloring and designs are amazing. Such talented ladies to make such beautiful cards. I love Newton's Nook Designs so much. I just bought two new stamps sets today. I'd love to have every stamp set. Thank You. Absolutely adorable set! Love the idea of unusual Christmas on the beach! Besides it's the first time I see great sentiments to match! I LOVE fun beachy scenes at Christmas, especially when we're down here near the Gulf! Love this idea! Love these fun beach ideas! The snowman is my favorite! Cute stockings with palm trees nd presents! Very beautiful and funny cards ! I love this lazy Santa ! This set is adorable ! Yes I would like to spend a warm Xmas once ! Thanks for sharing. I'm going to the Bahamas in February. OMG! Such adorable and funny set!!! I love so much this lazy Santa! Oh, this set is so fun!! Love it, and the DT inspiration! Oh my goodness that Santa on the tub is just amazing!! LOVE it!! Very cute cards. Thanks for the inspiration. Oh just when I told myself I have enough Christmas Stamps from previous years I haven't used and you ladies created these GORGEOUS CARDS!!! Newtons Nook how do I look the other way; especially when I will be moving south to FL as soon as my home sells!!!! Love the new stamp set!